Near Marsailles there is the ‘Calanque de Morgiou’ (Calanques are limestone cliffs very steep and with very deep waters with steep and dangerous shores). Henry Cosquer (35) who was a native of that area made a living by instructing pupils the lessons of deep sea diving. Probing the depths was a way of life for him. One day a deep cave about 37 meters below the surface of the sea aroused his fancy and he passed in to it pressing himself amongst the sea fans and corals that circled its mouth and went in to it to about ten meters not finding any end returned with determination not to leave it as such. After weeks he returned with most of the diving gears he could collect like flippers, oxygen, goggles, a powerful torch etc, this time he proceeded to about 40 meters inside and was intrigued as there was no end to it. The silt on the floor rose and made the water opaque and torch was of no use he returned with more determination of once reaching its end. There is a saying which means ‘if one who fails at the first attempt wins at the third’. A lake beneath the sea. It was so in Cosquer’s case. It was on one day in September, 1985 he set for the cave for half an hour he swam through the narrow cave and covered about 150 meters he was no more in a narrow cranny but seemed to be in a wide area and could stand up in waist deep water. Cosquer just flashed his torch what he found was something unbelievable. He was standing on the bank of an undersea lake more than 60 meters wide! A palace may be of mermaid’s! The stories of mermaid’s palaces beneath the ocean came to his mind. The lake had a ceiling of heights between two to five meters! The walls colored whit, blue and ochre, It was a virtual forest with majestic lime-stone columns. He had to stop further probing and returned due to lack of time but before that he tested the inside air by adjusting the air regulator and found it fit to breathe. In 1990 he planned an expedition for his Belgian friends Marc and Bernard. This time it was a scrupulously planned one they took along with all other devices a trailing cord that could guide them in case they lost way. With flash-lights they were probing the nooks and crannies of the lake an opening in the rock wall was visible and through it they could see another lake with a ceiling that towered in height of 30 meters! Cosquer made his fifth attempt in 1991 with a new batch of experienced divers from his own club. 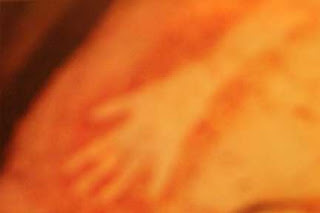 This time they dared to enter the other lake from there Cosquer for his surprise noticed an image of a human hand on the walls and was photographed. Reaching home when the films were developed he could notice two more hands and a feeling that they have bumped upon something marvelous began to haunt them. If Cosquer was not lucky enough to notice the ‘hand’ and the outside world would never have come to know about this prehistoric treasure that existed close to the ‘head quarters of fashion’ and Cosquer would have remained just one of the thousand diving instructors of the locality. They could not wait anymore within four days they returned to the caves with video recorder flood lights and all they wanted. There was a picture gallery in waiting for them, unusually small black horses, some of them where rather long from head to tail, goats with larger than life horns, bisons, and more pictures of hands. Penguins, cats, and engravings on the walls, stags all were there with a lot of overlapping one on the other. If all these were not video graphed no sane person would have believed them. In the meantime some people who noticed their frequent visits to the cave tried to explore it their own and three people died in the attempt as the silt made the blindfolded and in the panic they were all dead. This incidence made Cosquer think that it was time to release all and they straightly walked in to the Maritime Bureau in Marseilles. 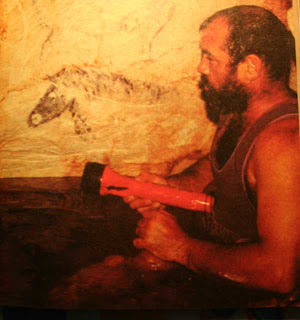 They had to work hard to convince the authorities about a painted cave far inside the sea. But for the goodwill of Jean Clottes and Jean Courtin, Cosquer would been driven away as a fraud. Jean Courtin (an authority in prehistory as well as an explorator) could understand the true value of the things found; those short horses were extinct varieties of once existed in the Paleolithic era tens of thousands of years back. All samples collected were subjected to carbon dating tests and age determined as more than 8,450 years. 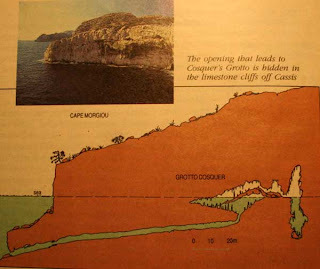 The cave was later named after Cosquer as Grotto Cosquer (Cosquer’s Cave) by the French government honoring him for the valuable treasure he had found by taking so much strain. Caves were the initial homes of men and he could not but give expression to his artistic talents on its walls during resting or idle times may be the usual concept of the images those appear on the walls of caves. 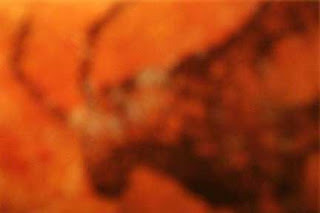 But David Lewis Williams states that there is a pattern in the carvings and images on the walls of caves and that would not have done as a time pass. 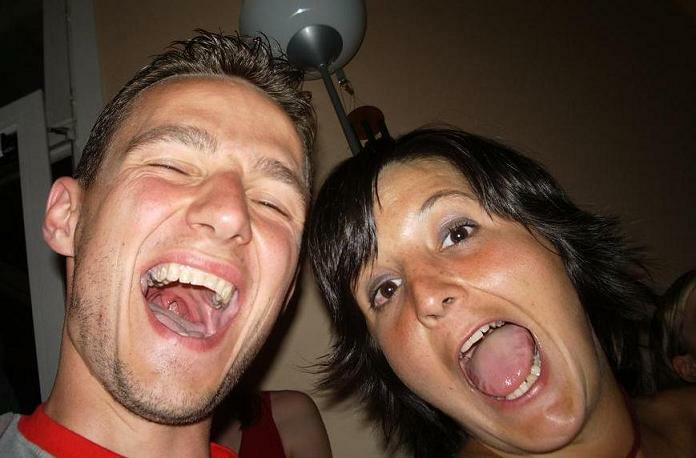 His studies based on ethnography pictures of things happened in the ‘Cro-Magnon arts in the following pattern. Each tribe has one chief; usually an elder one who exerted much clout among the members with some knowledge in witchcraft. At times he falls in to a trance and proceed to the most remote caves of the location (often feared as the abode of spirits an seldom visited by common members). He does the work in a trance about the objects which come to his mind at the instance. These were marks of devotion along with the expressions of a mind influenced by superstitions and primitive way of life. Whatever would have provoked them for these creations they have awarded men with invaluable treasures. I propose you something funny in my blog. Visit it! What an interesting article! I'd never heard of this cave before.